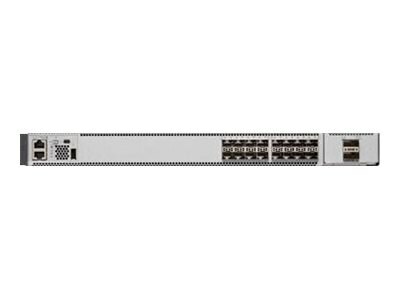 The Cisco Catalyst 9500 Series switches are the next generation of enterprise-class core and aggregation layer switches, supporting full programmability and serviceability. Based on an x86 CPU, the Cisco Catalyst 9500 Series is Cisco’s lead purpose-built fixed core and aggregation enterprise switching platform, built for security, IoT, and cloud. The switches come with a 4-core x86, 2.4-GHz CPU, 16-GB DDR4 memory, and 16-GB internal storage. The Cisco Catalyst 9500 Series is the industry’s first purpose-built 40 and 100 Gigabit Ethernet line of switches targeted for the enterprise campus. These switches deliver unmatched table scale (MAC/route/ACL) and buffering for enterprise applications. The Cisco Catalyst 9500 Series includes nonblocking 40 and 100 Gigabit Ethernet Quad Small Form-Factor Pluggable (QSFP+, QSFP28) and 1, 10 and 25 Gigabit Ethernet Small Form-Factor Pluggable Plus (SFP/SFP+/SFP28) switches with granular port densities that fit diverse campus needs. The switches support advanced routing and infrastructure services (such as Multiprotocol Label Switching [MPLS] Layer 2 and Layer 3 VPNs, Multicast VPN [MVPN], and Network Address Translation [NAT]); Cisco Software-Defined Access capabilities (such as a host tracking database, cross-domain connectivity, and VPN Routing and Forwarding [VRF]-aware Locator/ID Separation Protocol [LISP]); and network system virtualization with Cisco StackWise virtual technology that are critical for their placement in the campus core. The Cisco Catalyst 9500 Series also supports foundational high-availability capabilities such as patching, Graceful Insertion and Removal (GIR), Cisco Nonstop Forwarding with Stateful Switchover (NSF/SSO), redundant platinum-rated power supplies, and fans. Cisco IOS Universal is pre-installed. (2) 950W internal hot-plug power supplies; maximum. Limited lifetime warranty includes next business day response time and 90-day consulting and technical support.